A value in a data set that lies far outside of a pattern they establish. 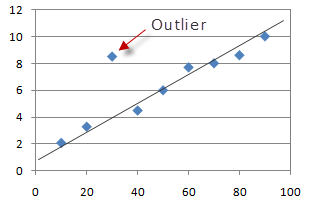 This is often taken as a sign that the data point may actually be an error. For example, if the graph shows pressure versus temperature in a science experiment, it may be that the pressure gauge was misread for that particular measurement. In this case the data point may be discarded from further analysis. However, the reverse may be true; the outlier may be an indication that some unknown process is at work and should be closely examined. Many scientific dicoveries have been made by investigating data that does not fit the pattern.